Your Essen Spiel 2013 Pick for "Game of Show"
I really enjoyed reading the picks and comments on my Your Gen Con Indy 2013 Pick for "Game of Show" geeklist, so why not keep the fun and momentum going with a list for Essen Spiel!? If you went to the show, or even if you watched the BGG TV live feeds. What game stuck out to you as "Best in Show"? I'm anxious to hear first impressions about what others saw and tried. I'm curious how some on my watchlist like Amerigo and Yunnan faired with its exposure at the show. Thanks, in advance, for sharing!! 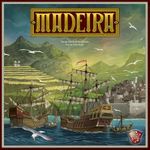 A completely original (not Agricola version 7), meaty/filling, 2 hour civ/economic game. Rich integration of theme. A little bit of randomness to keep things fresh, but group randomness to react to, not individual randomness. Drop dead gorgeous art and components. Same artist and publisher as the similarly weighted and criminally under-noticed Asgard. What's Your Game has shown that they can produce big box games that look fantastic and play well, and not sacrifice gameplay functionality for aesthetics. 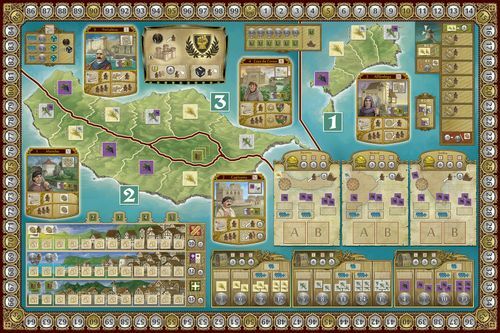 Compared to, say, Francis Drake, which has a nice looking board, but too busy for the key game elements to easily pop out. Previews from seasoned geeks (internationally, not just local friends) has been extremely positive. Designer diaries look great (1, 2, 3). Rules also look very well done. Speaking of which, I guess I need the microbadge... done. Though question, but I will go with Concordia. Played it once on the show, and it was great. This game is absolutely beautiful! The nicest art and components I've ever seen in a Euro. The gameplay is wonderful too...very tense and exciting! Picking the game of the show is very tough call for me. It would be a choice between Packet Row, Concordia, and Glass Road. 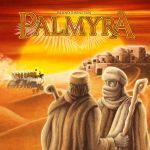 All three games, I believe, will eventually find their way into the BGG top 500. I think Packet Row was the most interesting to play and was perhaps the most interesting from a game design perspective, though perhaps modest in its component category. Nevertheless, this game, like Coloretto should blow you away with the elegance and brilliance of its driving mechanic...unless you have no heart or designer bones in your body! I had the game explained and demonstrated to me, at the very end of the show, and I can see why this game was so loved by the euro game crowd. 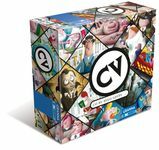 It has some reasonably fresh ideas in its card play, and glows with a certain Gerdts shine borne out of designing games like Antike and Imperial. He knows how to make games with maps work, and this one would appear to work and glow a bit...though since I did not ultimately play it, I just cannot give it the nod. So that brings me to Glass Road which I...and all other players I spoke to... found to be quite good. I would give it an 8 of 10 (so it is not at the masterpiece level of Agricola which I give a 9) as a fun euro to play. One thing I love about Glass Road is that it is "card choice driven" with a mechanic that "feels" related to one of my favorite card choice mechanic driven games - Witches'Brew. And notice I use the word "feel." The game also "feels" like an Agricola related game, in its aesthetic, which is going to work very nicely for the tens (hundreds?) of thousands of gamers who love Agricola, but that is about where the parallels end. The joy of Glass Road, (really a medium weight euro that, yes, can be played by the family) is in the clever card play, engine building, resource management, and "resource wheel" manipulation. For me, not having played Ora et Labora yet, that resource wheel was a bit of a mystery, feeling like a Feldian device thrown into a Rosenberg game. Or was that my imagination? And curiously, in the final analysis, is the joy of this Rosenberg game in the mechanics? Hmmm... a Feldian result? Brilliant mach-up (!) of Settlers & Dominion - only 50 copies available but I had the foresight to reserve one prior to the show and BOY! do I feel really lucky - it is AWESOME! I was drawn in by the theme (essentially, a Life- or Careers-style game about guiding a person through their life), but I was pleasantly surprised by the number of meaningful decisions available. You gather cards that represent experiences, relationships, careers, and so on by way of a Yahtzee mechanism, and the cards can provide additional resources (those generated by the dice), but only in limited ways. It has a bit of engine development and a lot of set-collection, but you will always have a cool life story to tell at the end. I thought I had seen everything. This game is awesomeness with a side order of coolness and a scoop of dazzling luminosity. From the three dimensional glasses to the psychadelic board to the gorgeously illustrated card deck to the fold and refold map covering different segments of the board, tnis game is unique, original, and a real trip. Perfect? Of course not. We started with trepedition as we didn't understand anything from the rules, and it initially looked like a play a card and move game. But there is a real game here, one with decisions and some strategy, but mainly the opportunity to revel in a dream like landscape with your friends. Thanks, Nate, for brining joy to our gaming table. Even if I never get to play again, it was worth my purchase. Right now I am going to go with Patchistory. Just basing this on a couple reviews and a bit of word of mouth. Rulebook sounds like it needs some work, but with a resource like the 'geek, that shouldn't be a problem that folks can't easily remedy. Love the idea of the Patching together your civilization both literally and figuratively. Components may be a bit on the ok side, but they look like they will work perfectly for what this game is trying to be, "a freeflow" civ builder. Definitely keeping my eyes open for this one. 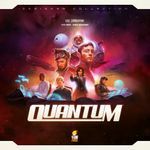 After buying "heavier"games for the last couple of years and finding them unplayed a year after, I decided to focus on the little games that play fast and will be played a lot. I bought this @Essen after seeing a french video review of the game. 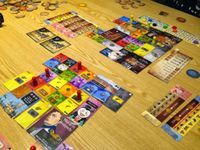 It is a easy to learn game that has already found our table quite often and keeps on being both fun and tactical and everybody that has played it wants to play it again and again. I didn't play many of the games I bought, but the best one of the ones I tries is Tash-Kalar. For me it is a very strange game. On the one side it is as abstract as abstracts are, but on the other side it is strongly connected with its theme (patterns for summoning, special abilities, high form combat, deathmatch, flares, etc). Modes of play makes this game really three games in one (high form, team play, deathmatch). I'm really looking forward to play this game more. The pure fun and involvment makes this an easy pick for game of the show! Battling it out in real time makes you laugh and cry at the same time. I played this with a team and group of complete strangers and this game easily brakes any ice communucation is key! I may be a bit biased as I've been playing this game since it's prototype form. 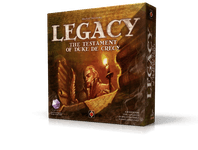 But Legacy: tToDdC is my pick for game of the show. It proves that you can design a euro game with a rich theme that makes sense. Besides its theme it also is a very solid medium weight worker placement game. You owe it to yourself to try this one. If you don't want to take my word for it. Look at the Kulkmann's G@mebox where the well know German reviewer calls Lecacy the "game of the fair"
This is the best game I bought on the fair this year. It looks gorgeous, it plays great and is yet another 'not-so-difficult' game that makes it possible for me to drag even more non-gamers into my boardgame-fold. I must say that we only went for one day and did not play longer games (I have high hopes for the new games I bought Tash-Kalar and Prosperity), but this short and elegant game gets my pick for the moment. 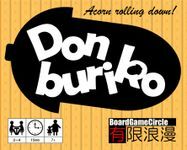 It's thematic in a minimalistic way, easy to teach and fun to play. I was lucky to play a full game of Eldritch Horror at the only demo table available. The game was not yet for sale, though. If you know Arkham Horror you feel right at home. Compared to Arkham the game is more streamlined than simplified. No more flow charts or outskirt limit calculation needed, no more book keeping in upkeep phase, etc. The design is simply better and more elegant (the event trigger mechanic is my favorite). Getting clue tokens now is an encounter (like drawing a location card) and traveling through Other Worlds is just a two step encounter as well. The biggest changes are the victory condition: Instead of closing gates you always have one, Ancient One specific, goal card in play that tells you exactly what to do (like: Drop 2 clue tokens and make a check at a specific location 3 times). Fulfill three goal cards before the dome track finishes and you win the game. On the road some monsters or other encounters will keep you occupied (like: Kill this super monster within 5 round or you lose the game). The biggest difference to Arkham is: You know exactly what you have to do at any given time. Achievements have be made within 1-3 round not over the whole game. All in all the game is more tactic and focused than Arkham but looses some of the epic storytelling appeal (no Sister Marry with dual winding chainsaws on a motor cycle anymore). Game of Show for me. Not played all my games from Essen yet, but of the ones I did play there, this was the most enjoyed by me. Russian Railroads a close second. The new TTA without war, and with better design (there are not awesome, but better). This game is on my list since months and the "sold out" on the second day show me I wasn't the only one. You have to read the Designer Diary of the game, absolutely mind blowing ! Number 1 for me, seconded by Russian Railroads and Madeira, whereas I wasn't at Essen. Waiting for the game in French in few weeks. 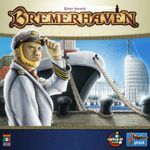 I didn't play a lot of games, but Bremerhaven is one of the best I played. It works very well with 2 players, and it's pure evil in a box. There's lots of interesting things to do. Expand the harbour, Prepare for larger ships coming, get ships, contracts, build buildings etc. The action selection is done by blind bidding, by placing one (or more) of your cards face down by the action space. You have 5 cards with numbers 1-5. You can upgrade the cards to get higher numbers. Some of the actions you win, only you can do, others the other players have to pay the difference between their own bid, and the winner, using their money. The ships and contracts all have a time frame. 1-5 time markers are placed on the ship or contract, and at the end of each round, a marker is removed. When the last marker is removed, the ship sails (with any of your goods left on the ship) and the contracts are due. You sell the goods on the contracts and get a bonus for fulfilling the contract, or the opposite if you didn't manage to get all the goods on the contract in time. The time concept is interesting. It can either help or hurt you. On one hand, you have time to unload ships, and load the trucks (contracts), on the other hand, they block the space, so you can't take any new stuff. Some of the ships and buildings has prestige points. At the end of the round you sum up all the prestige points. If the total is higher than your current prestige, you move up on the track. You need money during the game - LOTS of money. The problem is your prestige points are worthless without money in the end. Final scoring is money left x prestige points. Theres more stuff going on, but you get the basic idea. I agree with a lot of the suggestions above (with the definite exception of Rampage - see comments above), but the best time we had at the fair was a good hour spent with the Japon Brand guys. They are such nice guys and we played a few of their games. Donburiko and Eggs of Ostrich really stood out and we had such a laugh. We'd liked to have stayed longer but felt it was a bit unfair hogging the whole stand. Also worthy of note, and a bit of a surprise to me, was Rockwell which was nicely different. I had high hopes for this game (I had heard of the author ) nut didn't play it until the last day, back at the hotel It's such a good game that, after discovering a new rule in round 2, we were all willing to restart it all over again, and enjoyed it just as much the second time round. The group I went to Essen with purchased quite a few light filler games between us but this one has definitely been the highlight for me. Super quick and fun with great artwork! It's currently the game we have played most out of all our purchases. I remember seeing this on the preview list, but did not really go back to it. Played this Friday night and we became the third people to buy a copy in our game group we liked it so much. We played some of the rules wrong initially (learning a game after midnight will do that to you) but now we have them down and it is very enjoyable. 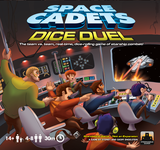 A light gamers' game, and one we expect to be a hit with our family and our game club. I went on Sunday, so lots of games I wanted to try or buy were long sold out. My personal highlight, based on just my one play on the fair was this one. Simple, fast, language independent, nice theme. Instant buy after one play. A toss-up between this and Tash-Kalar. We played two-player, and I have never laughed so much during a two-player game. It's basically 'supermarket trolley dash: the ten-minute card game'. You're rooting through piles of cards in real-time trying to match teapots, spatulas, etc. with player demands. First player to stop rooting through the pile becomes first player, and gets to choose which piles to search (there's a memory element). You buy the junk you've found at the price on the card back, and try to sell in a changing marketplace for the best price. First player to fifty yen wins. My husband went for a forty-yen spatula sale... And got the wrong colour spatulas in the rush. He was left with a handful of useless spatulas that he had to pay for... Hilarious. Many moments like that.